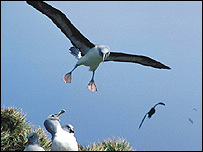 Research by UK scientists may prove vital in protecting the albatross. British Antarctic Survey researchers followed more than 40 grey-headed albatrosses as they flew around the world, identifying where they fed. All the birds which made a circumnavigation stopped for food in the same places. Banning harmful fishing methods from those areas of the ocean could help halt the decline of what is one of the world's most endangered group of birds. They are being killed in large numbers by becoming snared on the hooks of long-line fishing boats. Five years ago scientists from the British Antarctic Survey attached tiny tags to grey-headed albatrosses as they reared chicks on the Atlantic island of South Georgia. They were able to follow the birds for 18 months until they returned to South Georgia to breed again. The tags are simple devices weighing just a few grams. They record the timing of sunrise and sunset, enabling scientists to work out their position on each day; researchers retrieved the tags when the birds returned to South Georgia. Many of the tagged albatrosses flew around the world, some more than once, and some completing a circumnavigation in just six weeks. Others stayed close to home, and a third group went to winter habitats in the Indian Ocean. "It's the first time we've managed to achieve coverage for an entire breeding interval," the British Antarctic Survey's director of conservation biology Dr John Croxall told BBC News. "We were absolutely staggered to find how stable these three patterns are. "Birds that went round the world twice went back to the same locations, which is pretty amazing, because these are just about the most spectacular migrations of any albatross." The reason why birds should stop off at the same places is not clear, but the implication for conservation is. In principle, it should be possible to protect albatrosses simply by making sure that boats in the crucial areas use safe fishing gear. "We hope it's the beginning of a process of dialogue with the fishing industry," said Dr Croxall. "We and other groups are now carrying out the same kind of research with other species of albatross; and as one year follows the next we can have more of these species on line." 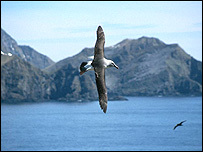 Currently boats fishing south of a latitude of 60 degrees are obliged to use techniques which are "albatross-safe", which can reduce the number of birds snared by about 90%. These techniques include using heavier weights on the fishing lines, which make them sink faster, giving the birds less time to eat the bait, and hanging streamers from the back of the boat which move in the wind, scaring the birds away. Dr Croxall believes that this sort of measure should be extended to latitudes between 30 and 60 degrees south.